Valentine's Day: it's my 2nd favorite holiday and I think it's probably Jeff's least favorite holiday. It must not be fun to be a guy with a significant other this time of year. There are so many instances in which, I feel, being a guy would be so much easier than being a girl, but Valentine's Day is not one of them and I look forward to it every year. 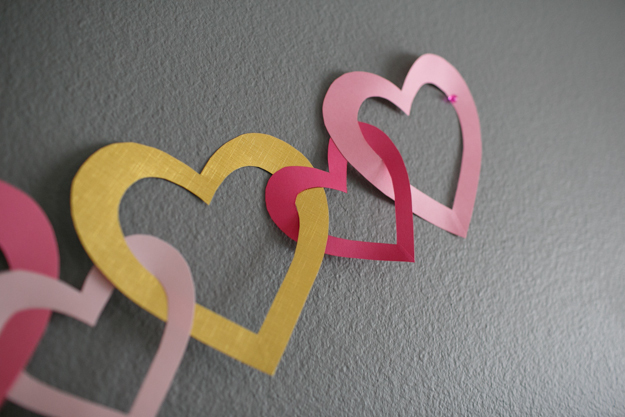 Did you know that Valentine's Day is also the second most celebrated holiday around the world? I checked wikipedia to see if Valentine's Day is supposed to have an apostrophe and found that interesting little bit of trivia. You know, just in case you're looking for a conversation piece these days. It's been a while since I crafted anything, so I thought making some kind of Valentine's Day decoration would be just the thing to satisfy my need. I don't have a ton of decor for this particular holiday and because we're going through a bit of a living room revamp right now, I figured creating some kind of wall decor would be just the thing. There are tons and tons of garlands out there right now, but this one struck my fancy for some reason. Maybe it's because it's from Martha. It's perfect for Valentine's Day but can also be used for parties or even a wedding if the theme allowed for it. Here's how I created mine. 2. Staple the template to your pieces of card stock where the dotted line is in the center of the hearts. If you're stapler is small like mine, you can either trim the template slightly on the right or open up the stapler like you would do if you were stapling something to a wall. 3. You're going to be cutting two different sized hearts with this template, the large one on the outside and the small one on the inside. Begin cutting along the outside border of the large heart until the entire shape is cut out. 4. 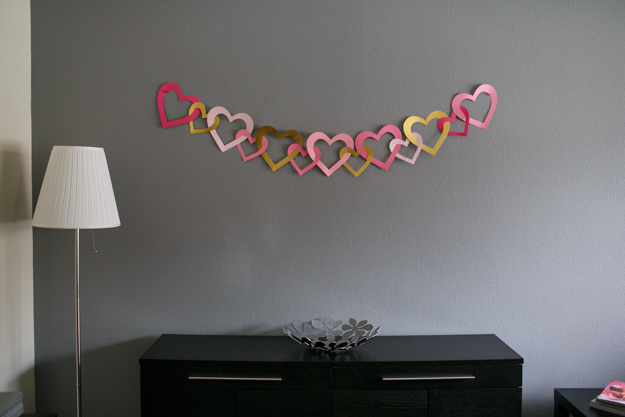 Make a small vertical cut along the solid line in between the two points at the bottom of the large heart and finish cutting the inner border. Repeat with the smaller heart. 5. 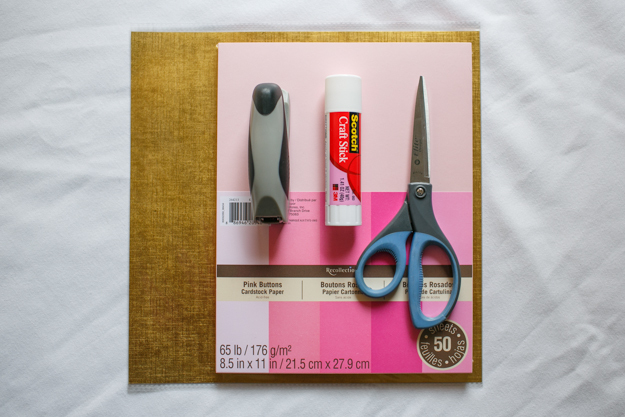 Repeat steps #2-4 with as many different pieces of card stock as you'd like. The more pieces you cut, the longer your garland will be. 6. Once you have all your hearts ready, begin linking 2 at a time through the cuts at the points of the hearts. Glue a small part of the ends of each heart together and reinforce with tape on the back. Then trim the excess so each heart forms a smooth point. 7. Repeat step 6 until your garland is as long as you'd like it to be! I like the gold addition!! !